Blackened sticks and burnt trees stick up eerily into the darkening sky. 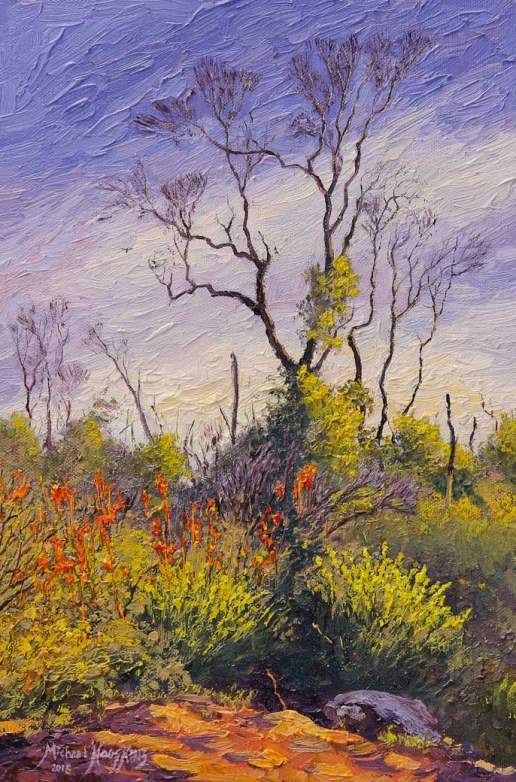 Among them the regrowth greenery and riotous wild-flowers of spring burst out everywhere in the late afternoon light. How do I capture this with fresh vibrancy and brooding moody light; and do it with just three tubes of paint plus white? Read on to find out more and download the demonstration. 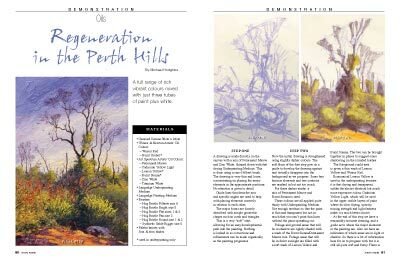 The painting was recently featured in Artists Palette magazine and now the publishers have kindly allowed me to make the complete article available for download on my website. Every step is detailed so you may treat this as an exercise if you like and create your own version. If you do, please send me pics as I’d love to see them and I’d even be happy to help if you have a go and get stuck. I remembered my Dad’s paints sitting in the drawer waiting. From them I selected Winsor Red and Permanent Mauve, two paints I had never used before. I imagined the strong moody mauve/blues and deep purples that would come from this melding and added one tube that was familiar to me in order to balance out the colour scape, Cadmium Yellow Light. So, a lot of valuable stuff there to help you along with the struggle every painter encounters when attempting to use photographs as the compositional basis for a painting.